With a winter deep freeze in many places around the globe, what was once just an idea of a family vacation somewhere warm and sunny, has become a must-do trip for many parents. If the thought of white sandy beaches and shining blue water sounds like a good fit, think about going to Fiji with kids. Fiji isn’t just one place: the country includes 333 islands, but only 110 are inhabited. The aerial views as you arrive set the scene perfectly; pristine white beaches and blue water make for the perfect outdoor playground. 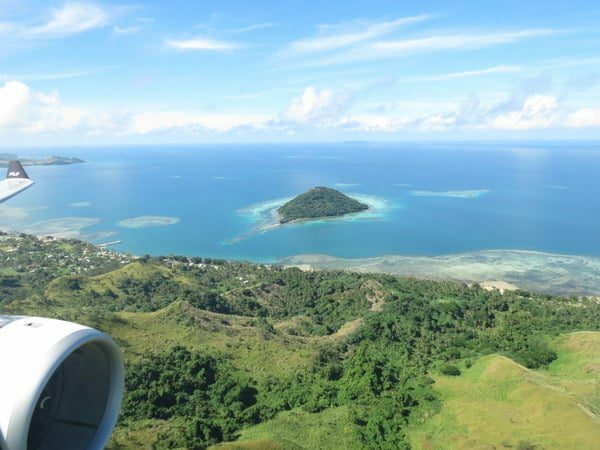 It’s most likely your plane flight to Fiji will take you to Nadi, the main airport. Fiji Airways, the country’s national carrier recently added three new A330s to their fleet and offers direct service from Los Angeles. Many travelers, especially Americans, think of Fiji as a romantic destination. And there’s no question about it, Fiji is a perfect place for couples, but with all those island beaches, there’s plenty to share and families are reaping big benefits. One of the most popular places to stay is Denarau Island, just 20 minutes from Nadi International Airport. Denarau Island has beaches, a marina, shopping, an 18-hole championship golf course and is home to eight large resorts, including the Radisson Blu, the newest luxury family resort added to the CB! Hotel Collection. On the beach and spread across 10 acres, the property has all the makings of a fun and relaxing family vacation. Though the actual property is large, the number of rooms, 270, is fairly small, giving the Resort a more intimate feel. Suites with full kitchens are available, a nice option especially for families with younger kids who often tend to eat on their own, sometimes sporadic schedule. Dinner is Served … In the Pool! That said, if you want to throw your kids for a loop, ask them if they’d like to have dinner in the pool. Yes, dinner in the pool; it’s not a typo. Lomani Wai offers dining in the water. Guests remove their shoes and wade in the knee deep pool to their table. So no pants of long dresses for this meal; think dress shorts and skirts. I’ve never seen anything quite like it. The menu offers traditional foods like kokoda (the Fijian version of ceviche) served in a coconut bowl and more kid-friendly dishes like marinated chicken and beef. There are plenty of towels poolside in case anyone gets wetter than expected. The whole family should plan on getting and staying soaked for a good stretch of your stay at the Radisson Blu. Beautiful lush gardens surround one of the largest lagoon swimming pools on Denarau Island. There are actually four pools for guests to choose from, two with slides for kids. No worries about the kids splashing child-free guests. They can retreat to the adults-only pool. Though the Resort is popular with couples and families, the active Kids’ Club is hard to miss, even if you’re in couple mode. Kids rule the Resort during the nightly, costumed, torch lighting sessions. Designed for kids ages 4 through 12 a typical day can include everything from Fijian lessons to lizard hunting and boat making. The assorted adventures give parents the chance to try out Resort activities ranging from wind surfing and kayaking to coconut bowling and basket weaving. Though I look forward to my family un-plugging a bit while on vacation, I love the fact that free WIFI is available throughout the resort. So, no high fees are required to brag to family and friends back home. Fiji has beautiful islands, but one of the best things about Fiji is its people. Don’t go home without meeting and experiencing their friendly hospitality. The Radisson Blu offers what they call School Trips. A couple hours in length, guests can sign up to visit one of the local schools adopted by the Resort. For a full day experience, a Sigatoka River Safari excursion is an easy way to get a snap shot of Fijian village life. Using a combination of driving and traveling by boat, tours visit a different village every day, Monday through Saturday. Villages only participate for six months at a time to lessen the impact of tourists. If your family likes to explore, the Bula Bus is a fun change of pace. The open air trolley runs on a continuous loop around Denarau Island, stopping at all of the hotel resorts and the Denarau Shopping Centre (with a small, but nice grocery store) every 15 minutes or so 7:30am to 11:30pm, 7 days a week. At just $4 US, $8 FJ it’s a bargain. Want to Know More? Read the review of the Radisson Blu Fiji Denarau Island now part of the Ciao Bambino Approved Hotel Collection. Our Check Availability Form goes right to the hotel for best possible rooms and pricing. Want planning assistance? Our new Family Vacation Consulting Team can book a room on your behalf and help with other vacation details.